"Pizza on Earth, Good Will to All!" A good book with lots of great dishes! pizzatherapy.com gives his book and show 4 stars!! I use olive oil for my pizza, but it is not essential. To me, the pizza just seems to taste better with olive oil. Instead of stewed tomatoes you can use fresh tomatoes, left over spaghetti sauce, or commercial tomato sauce. Any of these will work well. Uncooked spinach works great, but you may blanche if desired. Wash, drain and squeeze excess water before using. Canned spinach will work OK. Make sure the spinach is drained before using. I like my onions and peppers cooked before I put them on the pizza. I use a sauté pan and lightly sauté the onion in some oil. I roast the peppers in an oven to take the skin off. I put the peppers on a cookie sheet and broil until the outside skin starts to turn black. I then scrape off the blackened skin and discard. I slice the peppers and place on the pizza. Store your roasted peppers in olive oil with a few cloves of garlic. Use in sandwiches, omelets or as a side dish. There are many types of mushrooms which taste wonderful on pizza. Commercial white mushrooms are good, but for an incredible taste, try some different kinds! and it took us two days to clean all the mushrooms." He said he learned which types to pick from his father, who was born in Italy. My dad would only pick certain kinds of mushrooms. When we returned home, my dad would go over each mushroom again, to make sure they were safe to eat. My mom cleaned them, with a little of dad's help. These mushrooms give the pizza a different taste which I would describe as "earthy". Generally, the mushrooms would be sautéed with sausage and peppers. The taste is slightly stronger than the "store bought domestic" variety. 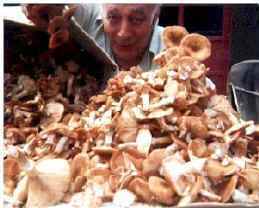 Commercial mushrooms taste bland in comparison to the "wild mushrooms". My favorite type of mushrooms for pizza are oyster mushrooms. You can usually find them in the produce section of your grocery store. Try some oyster mushrooms and you will be in for a fantastic taste treat. Sauté them in a little olive oil with garlic and put them on your pizza. Oh, Mama Mia! For a wonderful treat try our Spinach and Mushroom Pizza recipe!